Arrival At Port Blair in the Morning By Flight/ship and Transfer to Hotel. After Lunch visit Ross Island - from where the Britisher's governed the entire A&N islands, prior to India's Independence. This island is an ideal destination for nature walk amidst sylvan surroundings with deers, peacocks attend the enthralling Sound and Light Show at Cellular Jail - where the heroic saga of the Indian freedom struggle is brought alive. Overnight stay at Port Blair. Start after breakfast for a full-day Excursion to Jolly Buoy Island or Red Skin Island (Coral Island) - to see coral reefs, exotic varieties of beautiful ornamental fishes and other marine life. The glass bottom boat ride helps one to take a closer look at the vast coral colonies. Optional Activities - Snorkeling, Swimming & Trekking. Overnight stay at Port Blair. Today, we start our journey towards Havelock island Mackruzz Deluxe from Port Blair Harbour. On arrival at Havelock Island (57 kms by sea from Port Blair). lush green forest in a comfortable beach resort. Then after breakfirst proceed to the Kalapathar beach where you can watch the beautiful sunset. Optional activities are swimming Radhanagar Beach, the Times Magazine the finest beach in Asia. It is an ideal place for swimming, sea bathing and basking on the sun kissed beach. 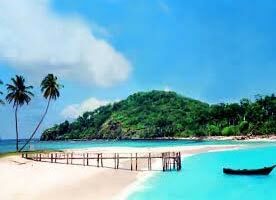 same day return Overnight stay at Port Blair. Baratang Island Mud Volcano, Limestone Caves (Full Day Programme) and same day return and Sagarika ( the Govt. Emporium of Handcraft) and local market for shopping. Over night stay in Port Blair. After lunch Viper Island and Viper Island, named after the ship wreck event of a British trading ship named "Viper" in 19th century, is located near Port Blair. The ruins of an olden discarded jail, built by British in 1867, with yellow colored bricks and the gallows are seen in this Island. The Island was considered as the place of penal settlement for the freedom fighters of India. 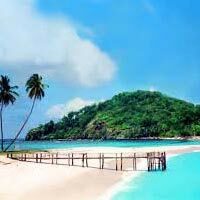 Viper Island is a serene beautiful tourist destination and can be approached by harbor cruise originating from Phoenix Bay Jetty in Port Blair. This place is visited by number of tourists as it has multiple attractions with historical importance and also has mesmerizing picnic spots with natural picturesque environments, candle light dinner. North Bay Island in sequence. North Bay (Coral Island) - to see coral reefs, exotic varieties of beautiful ornamental fishes and other marine life. The glass bottom boat ride helps one to take a closer look at the vast coral colonies. Optional Activities - Snorkeling, Swimming. Then proceed for a leisurely cruise (Harbour Cruise) in a steamer along the Port Blair Harbour - which takes one to north bay.. Andaman Water Sports Complex. After lunch Â then to Sagarika( the Govt. Emporium of Handcraft) and local market for shopping. Drop to Port Blair / Airport for Return journey with a wonderful holiday memories.